One bedroom holiday let, close to Bath and Castle Combe. For an easy-breezy relaxed and welcoming stay, Dove Cottage will charm the socks off you! Situated along a secluded stretch of country road in the quiet hamlet of Easton Piercy, our newly renovated one bedroom cottage offers a luxurious super king/twin stay for 2 (+1 – there is a comfy sofa bed in the living area). Dove cottage offers a “self-catered bed & breakfast” retreat in a homely single-storey spacious atmosphere. Great care and attention has been placed on providing high quality furnishings with a chic country feel in light-muted tones. With laid-back views overlooking the fields of our working farm, your stay will be the perfect spot to leave your worries behind. 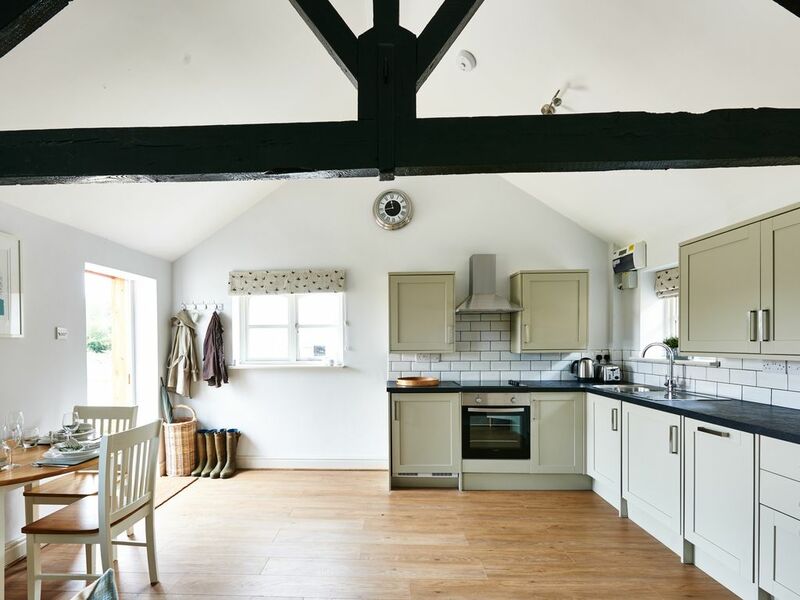 Set within our farmyard in beautiful and inspiring Wiltshire, Dove Cottage is conveniently located 2½ miles away from Castle Combe, 25 minutes from Bath and an escape to the heavenly Cotswolds is only a stones throw away. Fantastic little cottage in a great rural location. Really enjoyed staying at this fantastic cottage. Good range of modern facilities with excellent hosts. My partner and I stayed at the Dove cottage over the new year period. The views were goregous and the family who owned the cottages were very friendly and welcoming. The cottage itself was goregous with lovely views of the surrounding land. Inside was very much goregous to say the least. Everything was ready for us to enjoy our stay...fridge stocked with butter, fresh orange juice and milk. The cupboards stocked with all you could need. Cereals and jams were provided along with fresh bread, croissants and fresh eggs. The bed was absolutely out of this world very big, with lovely fresh linen. The cottage was everything we could of hoped for. I like to be visit places that are like home this was truly that, we really didn't need to pack as much as we did because most of the stuff was provided. We really enjoyed our stay at the Dove Cottage, my partner and I also got engaged here as the place was so romantic. We will definitely be visiting again. If you would love immaculate, quiet, peaceful, rural accommodations - stay here! I stayed in both Garden and Dove Cottages during my 8 night stay and both were perfect. Both are beautifully finished with lovely details and spotlessly clean. The full kitchens are well equipped and include dishwashers and washing machines. I'm not sure if I can now live without a Nespresso machine. These are self catering cottages but with breakfast items supplied - eggs, delicious bread, OJ, milk, tea, coffee, butter, croissants, jam, cereal and sugar etc. Fabulous. Add to that the peaceful, rural setting and views over garden and paddocks and I could not be happier. The M4 can faintly be heard and that's really it for noise as there is very little traffic on the road. The beds are excellent with lovely linens - I slept extremely well which is unusual for me away from home. The bathrooms have fluffy white towels. Your host family are delightful too. Kington St Michael is just a short drive or long walk down the lane and it is quaint and has an excellent Cafe for lunch or a cream tea. I had a wonderful stay here and will be back! We have rented many self-catering homes around the world. Dove Cottage is among the best. The cream tea on arrival was delicious and thoughtful. Fresh croissants and orange juice every morning was so nice. Catherine fills the pantry with eggs, cereal, milk, nespresso machine etc. The super king size bed is very comfortable, and the shower was the best we had in thexthree months we were in England. Catherine really knows how to deliver luxury. The single lane track to Cromhall Farm is a bit of an adventure. Watch out for the sheep. Well located for enjoying Wiltshire and Somerset. Please see our website - "Cromhall Farm" for additional information. CHECK-IN from 4pm on the day of arrival. An early check in may be accommodated by prior arrangement only. Please advise if your expected arrival time will be later than 8pm. We will not accept arrivals after 10pm unless previously arranged or you have kept us informed. CHECK-OUT by 10am on the day of your departure. If you require a later departure time, please let us know in advance and we will do our best to accommodate you. Please can you leave the cottage in good order when you leave. DEPOSIT a deposit of 50% is required to secure your booking. If this is cancelled or modified up to 14 days before the date or arrival, no fees will be charged. If changes are made after this time, the deposit is non-refundable. CANCELLATION POLICY - A booking made with us is a contractual agreement. It is our policy that, should you cancel your booking within 14 days, we will retain the 50% non-refundable deposit. CHILDREN - Cot can be provided. Please bring your own linen. Sofa bed available in the sitting room. Additional charges occur for use of sofa bed. MINIMUM STAY of 2 nights. SMOKING POLICY - We operate a strict no smoking policy within Dove Cottage, and to all areas of the grounds and outbuildings of Cromhall Farm. DAMAGES do occur! We ask that you take care when staying in the cottage and report any incidences as they happen. You are responsible and liable for any breakages or damage which you cause to the accommodation or its contents. A charge will be made if damage or breakage is significant. LIABILITY - We shall not be liable at Cromhall Farm for any loss, damage, expense, accident, injury, illness or inconvenience whether the person or property which you or any other person may suffer or arising out of or in respect of your booking at Dove Cottage, Cromhall Farm. Please do contact us if you have any questions.